Got an older meaty Mortlach today. I’ve heard in the past of the savoury Mortlach style, but never really experienced it. From what I know it tends to come from the sulphur-y style of the spirit, then matured in Sherry casks. 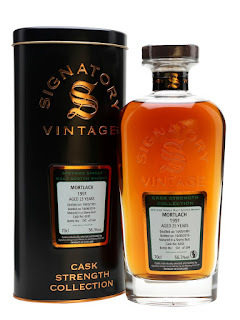 So, this one is an older Mortlach from Signatory fully matured in a Sherry cask and bottled pretty recently. Of course, the prices have been soaring to keep up with the ridiculous OB’s. Nose: Meaty! Pastrami, salami, black pepper, men’s cologne. The Sherry influence is pretty obvious but the spirit is balancing it well. Taste: Spicy pastrami, amazing meaty fruit, pomegranate, meaty raisin, men’s cologne again. Finish: Long length. More meaty with some oak, cologne and spice. Bottled 2016 at 25 years old. This is amazing, lovely style but maybe not for vegetarians.